Unfortunately, no. At present time, this functionality is not available. 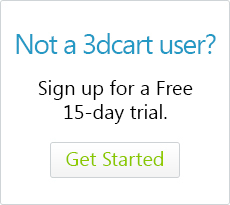 If you are listing a certain number of units for an item on eBay, and the item sells on eBay; your 3dcart store's inventory is updated to reflect the change in stock. However, if the item sells on your 3dcart store, inventory for the eBay listing is not updated in the same fashion. To prevent this, it is recommended that you use the "Allow stock to be updated when listing on eBay" option in your eBay module settings. This setting will remove the number of listing units from your 3dcart store's inventory. In other words, if you have 10 units on hand of a particular item in your store, and you list 3 of them on eBay, this checkbox will update your store's inventory to reflect 7 since 3 of them are designated for listing on eBay. Full information on setting up the eBay integration can be found here.